Sony continues to deny that its PlayStation 3 motion controller wand thing is called the "Arc," saying that such reports are nothing but rumors. Trying to guess the "real" name of Sony's motion control gizmo for the PS3 has become something of a game, albeit a dull, pointless one with really long pauses in the action. 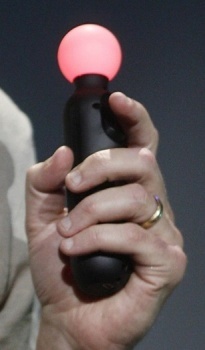 It was called a "wand," more or less generically, after it debuted last year; then in December, Electronic Arts CEO John Riccitiello referred to it in a speech as "Gem," although SCEA Director of Communications Patrick Seybold quickly issued a statement saying that was just an "early code name" for the device. Now we have "Arc," which first popped up as a rumor from a "reliable source" in January. That name appeared to be confirmed yesterday by THQ boss Brian Farrell during a conference call to investors when he said, "Turning to kids, family, and casual, we are focused on our continued leadership in this category, taking advantage of the lower hardware price points that we expect will attract new mass market gamers and new family-friendly platforms such as Microsoft's Natal and Sony's Arc motion controller." But Seybold is once again playing the spoiler: Earlier today, he issued a statement saying that Arc isn't it, either. "We haven't announced the name of our Motion Controller," he said. "[Farrell] referred to it as a rumored code name." At some point Sony is going to have to give this thing a name and tell us what it is, and I really wish they'd just get on with it. I'm getting tired of calling it the "wang." Whatever it is, Sony's motion controller is currently slated to hit the market in the fall of this year.